A track from Cathy Dennis' second album 'Into the skyline', this single peaked at number 24 in the UK singles chart. This and subsequent singles seemed to get into the top thirty without too much trouble. In America, Dennis experienced a brief peak of fame, making a cameo in 'Beverly Hills, 90210' singing the song 'Moments of Love' (a minor U.S. chart hit). I bought this single shortly after I'd bought the cd 'Into the skyline', but in time I experienced that Cathy Dennis' singles from 1992 aged quite quickly. When I heard this song and saw Cathy Dennis for the first time, I thought she was just another bimbo with a nice popsong. Almost two decades later I have to admit she's more than just a pretty face: she co-wrote Kylie's 'Can't get you out of my head', one of this decade's most wellknown popsongs. Cathy Dennis was born as Catherine Roseanne Dennis on March 25, 1969 in Norwich, England. As a teenager she was spotted recording demos at The Kitchen in Norwich. Simon Fuller signed her to his 19 Management company and to label Polydor at age 17. A successful career in music followed. 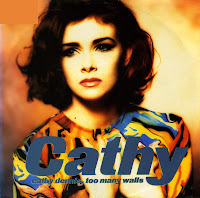 'Falling' was the third single from Cathy's second album 'Into the skyline'. The track was remixed for the single release by the then-popular band PM Dawn. It peaked at number 32 in the UK singles chart.